The Unicorn Spell is a green floral with a focus on violet. Isabelle Doyen says: "If by dawn still linger on your skin mixed scents of leaves, frost and violet blooms, and that relentless yearning for stellar sights, you will know that, at night, you felt the milky breath of a unicorn". Of skies open like an endless azure cut oozing signs of the coming storm. 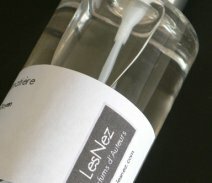 Fragrances and samples can be found at lesnez. Darn! Why do I keep reading about these new releases? Leaves, frost and violet blooms?? Gotta have. Lordy lordy! The poughetry of writing perfume ad copy gets crazier and crazier all the time. It is as if army of writers with repressed memories of flunking Creative Writing have taken over and are all hellbent to show us that THEY CAN WRITE, DAMMIT! Should I be scared? these are the words which go with the perfumes – the author is the perfumer herself – if you don't find the words in the bottles – I hang my head in shame. P.S. We don't know what marketing is – we just bombard bloggers with samples. It does sound very lovely, doesn't it? Hope to try it this week. LOL, I hope so too A! Ok OK you sold me, I'll sign up for a sample to find out what relentless yearning smells like and if it bears any relation to a fatter paycheck. You have to admit it's just a wee bit over the top, yes? Have fun! I love the name “Let Me Play the Lion”. It's extremely vivid and specific. Of course not everyone will be like Bottom of “A Midsummer Night's Dream” but his capacious, wide-ranging, enthusiastic spirit is a great entree into the perfume. I have not tried it yet but for this lover of Shakespeare it will be a must to sample and probably purchase.